Kalypso is a female Kritter who makes her debut in the game Donkey Kong Barrel Blast, where she is an unlockable character. Currently, she and Kass are the only female Kremling characters to have appeared in a game in the Donkey Kong franchise, although King K. Rool has been implied to have a wife in some games. She is also one of only three Kremlings who have hair, sharing this trait with Kass and Kasplat. Her name is derived from the style of lively Caribbean folk music known as "calypso". 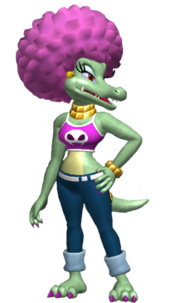 According to her European trophy description in Super Smash Bros. Brawl, she seems to have a high rank among the Kremling Krew as she is described as being a strong leader figure while having trust of the full crew, including King K. Rool. She is also good at sports and dancing and owns a clubhouse. In her first appearance, Kalypso joins the Kremlings and races against their long lifetime rivals, the Kongs. She is an unlockable character, and is unlocked by winning the Sapphire Cup with a Kremling. She appears in the game as a rival for Tiny Kong; as such they share stats and have similar body composition. Kalypso slashes with her claws as her attack. Her bongos are designed to represent her purple palette and golden jewelry. She has top boost and good speed, but below average agility similar to Tiny. Aside from the main game she can be seen in various cutscenes. In the Single Racing cutscene, Kalypso can be seen, alongside Kass, Kritter and Klump, in front of their rivals, Tiny Kong, Dixie Kong, Donkey Kong and Lanky Kong. In the Time Trial cutscene she can be seen along with Kopter and Diddy Kong as part of the public giving indications to Kass and Lanky Kong of which lap they are on by showing them a sign. She makes another appearance in one of Candy's Challenges in Challenge # 14: Help Tiny Kong!. Donkey Kong has to help Tiny Kong beat Kalypso in a race; this challenge is level 2 in difficulty. Kalypso also appears in Super Smash Bros. Brawl as a sticker and a trophy, both of which can appear at random in one of the game's modes, such as Vs. or Adventure Mode. When the sticker is used on any fighter in The Subspace Emissary, it boosts their launch power by 26 points. Her trophy description in the European version of the game mentions that she owns a clubhouse and that she is good at sports and dancing, while also being a good leader. Kalypso reappears in Super Smash Bros. Ultimate as a Novice-class support spirit. When used on a fighter, it equips them with a Rocket Belt at the start of a battle. In World of Light, the spirit is located in a small forested area in the south-west of the Light Realm. In its corresponding battle, the player has to win against a team of four Wendys on the Kongo Falls stage. The core obtained from Kalypso's spirit can be combined with Don Flamenco's core to summon Jimmy T.'s spirit. Kalypso has pale blue-green skin, red eyes, a purple top with a skull on it, purple claw polish, blue jeans with a white belt and golden jewelry around her neck, left wrist and her tail. Her hairstyle is a large purple afro. Her size complements Tiny Kong's; as such they rival each other in her debut appearance. Kalypso has been described as a cool and attractive character, but it is said she has a high-pitched laugh. She is also described as being a good leader who has the trust of all the Kremling Krew as well as having good reflexes. She is also good at sports and dancing, the latter never having been shown in games. Kalypso is known to own a clubhouse which is seen as an oasis by all the Kremlings. Unlock method: Win the Sapphire Cup with a Kremling. (PAL) Wii Donkey Kong: Jet Race 2007 A cool beauty with chic makeup and groovy hair. Kalypso combines enough acceleration to break free from the pack with a respectable top speed. Her cornering is a bit weak, but good players should be able to overcome this. Her claw attack will get you...if her high-pitched laugh doesn't. A cool beauty with chic make-up and groovy hair. A strong leader figure, she has full trust of all the Kremling Krew. She boasts excellent reflexes, and is very accomplished in sports and dancing. The clubhouse she owns is regarded as something of an oasis for Kremlings. Karipuso Calypso, from the English name. This page was last edited on April 8, 2019, at 18:27.